Georgette Lizette "Googie" Withers was an English theatre, film and television actress, who mostly appeared in films along his husband, actor John McCallum. During the 1930s, Withers was constantly in demand in lead roles in minor films and supporting roles in more prestigious productions. Her best known work of the period was as one of Margaret Lockwood's friends in Alfred Hitchcock's The Lady Vanishes (1938). Among her successes of the 1940s was the Powell and Pressburger film One of Our Aircraft Is Missing (1942), a topical World War II drama in which she played a resistance fighter who helps British airmen return to safety from behind enemy lines. She is remembered for her role as the devious Helen Nosseross in Night and the City (1950), a classic film noir. While filming The Loves of Joanna Godden (1947), Withers met her co-star, the Australian actor John McCallum. They were married on 24 January the following year, and remained married until McCallum's death in 2010. Withers first toured Australia in the stage play Simon and Laura. When McCallum was offered the position running J.C. Williamson Theatres, they moved to Australia in 1959. Withers starred in a number of stage plays, including Rattigan's The Deep Blue Sea, Desire of the Moth, The First 400 Years (with Keith Michell), Beekman Place (for which she also designed the set), The Kingfisher, Stardust, Chekhov's The Cherry Orchard and Wilde's An Ideal Husband for the Melbourne Theatre Company; both productions toured Australia. They appeared together in the UK in The School for Scandal at the Duke of York's Theatre in Londons West End and on the subsequent British Council tour of Europe in 1983–4 and in W. Somerset Maugham's The Circle at the Chichester Festival Theatre. Withers starred on Broadway with Michael Redgrave in The Complaisant Lover and in London with Alec Guinness in Exit the King. During the 1970s, she appeared as Faye Boswell, the governor of a women's prison, in the television series Within These Walls. Because Within These Walls had been a moderate success in Australia, she was approached by producers to play the role of the Governor of the Wentworth Detention Centre in the later series Prisoner, a job which she declined. The role eventually went to Patsy King. In 1986, Withers starred in the BBC adaptation of Hotel du Lac, which was followed a year later by another BBC production of Northanger Abbey. In 1990, she appeared in ITV's adaptation of Ending Up. Her last screen performance was as the Australian novelist Katharine Susannah Prichard in the 1996 film Shine, for which she and the other cast members were nominated for a Screen Actors Guild award for "Outstanding performance by a cast". In 2002, aged 85, Withers appeared with Vanessa Redgrave in Oscar Wilde's Lady Windermere's Fan in London's West End. In 2004, Withers came back into the news when a character on the ITV soap Coronation Street, Norris Cole, quipped that "Googie Withers would turn in her grave". Granada Television was forced to apologise a week later when they realised that she was very much alive. In October 2007, aged 90 and 89 respectively, Withers and McCallum appeared in an extended interview with Peter Thompson on ABC TV's Talking Heads program. Withers died on 15 July 2011 at her Sydney home, aged 94. Her husband John McCallum predeceased her on 3 February 2010. 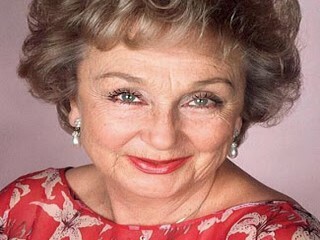 View the full website biography of Googie Withers.